Despite the rise of technological or digital equivalents, business cards are still heavily used in today’s business world. They remain effective marketing tools that allow individuals to personally interact with other professionals. 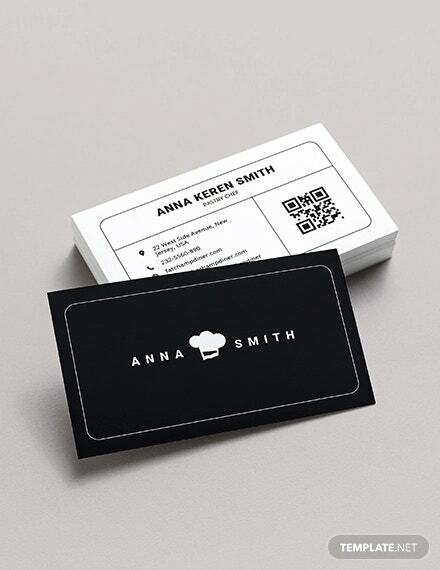 Business cards are not only limited to manufacturing, financial, and tech companies, but they can also be used in other industries such as business outsourcing, agriculture, healthcare, and food service. 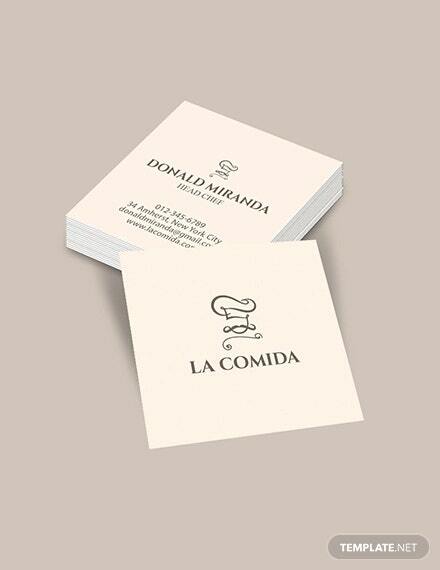 Restaurateurs or chefs also need business cards when dealing with other individuals in their industry, e.g. meeting with other chefs to discuss new dishes or plan cooking events. 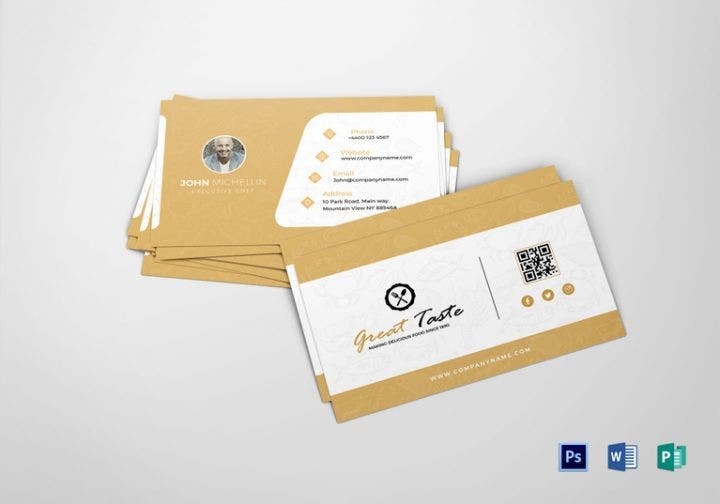 If you are a chef or a cook working in a restaurant, here are some affordable yet quality business card designs you can use. 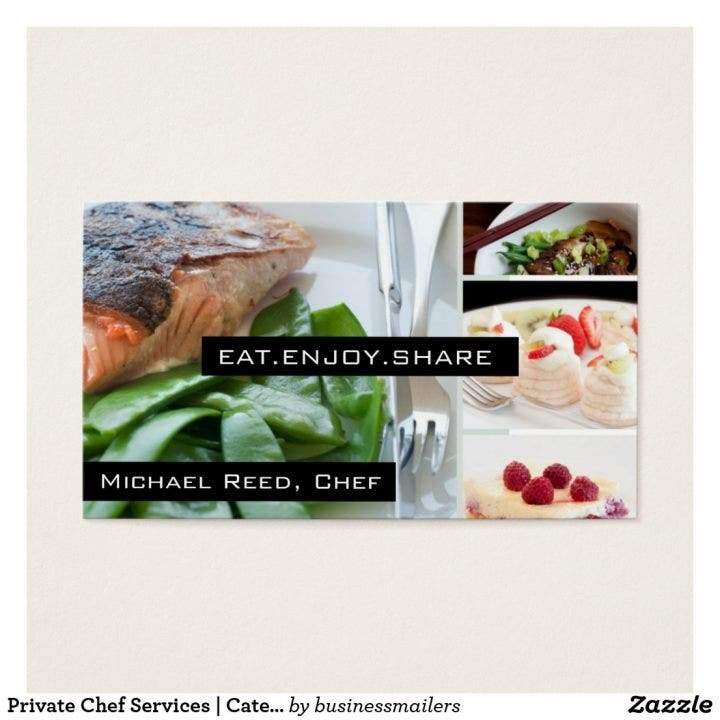 This curated collection has some of the best restaurant chef business card templates around, so purchase one today. 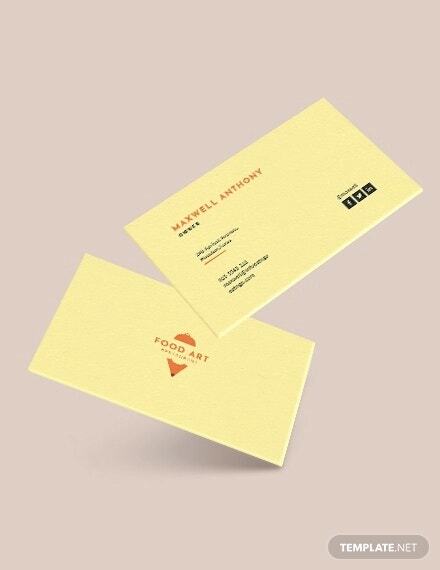 This restaurant chef business card template should be on the top of your priority list. This template uses a gold color that can fit any design. Your fellow chefs will be envious when they see you using this elegant business card. This template is fully customizable and editable. This personal chef business card has a modern contemporary design that looks very attractive. The knife image and brick background provide the main visual attraction of this template. 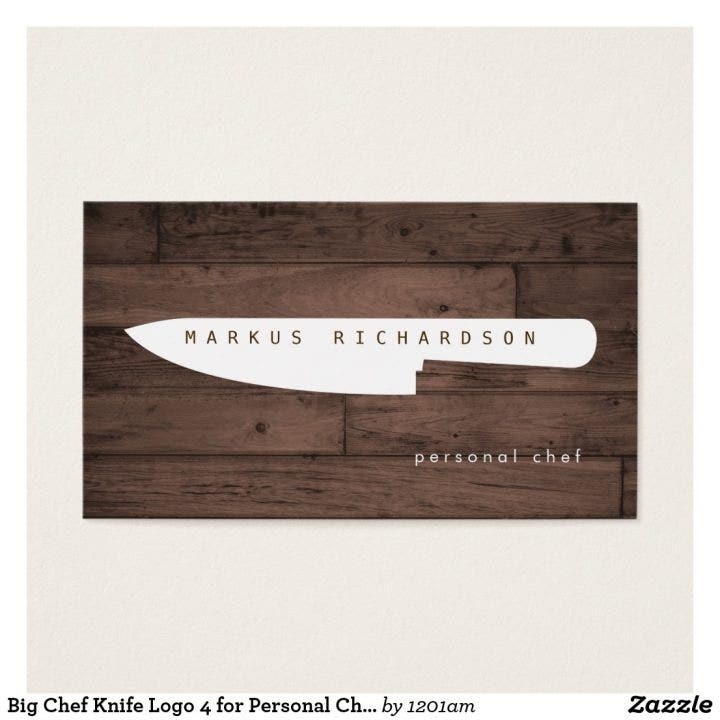 This chef business card template can be easily edited so you can type your name within the knife image. This nutrition chef business card has a clean yet very attractive design as it uses food photography of vegetables. The vegetables are arranged in an elegant manner and the card contains some beautiful details unmatched in other business card designs. This template is editable and you can list down your own details (name, contact number, email address, business address, etc.) at the back of this template. Aside from using food as the main designs for your business cards, try the next best things: kitchen utensils. 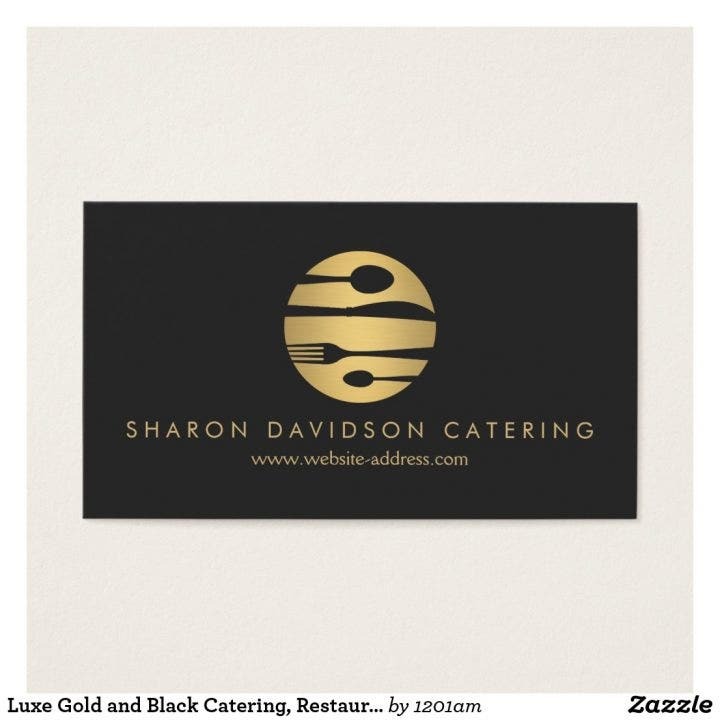 This catering business card uses some beautiful glitter designs that will surely be a hit with your clients and fellow chefs. Three utensils are used in this template: a whisk, a spoon, and a spatula. 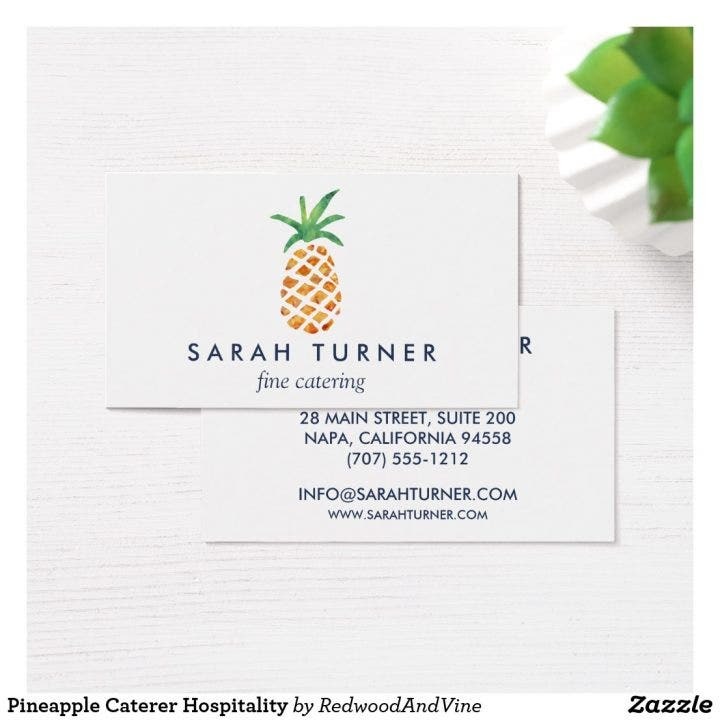 This pineapple caterer business card is another business card you should definitely use, even if you are not serving pineapples. 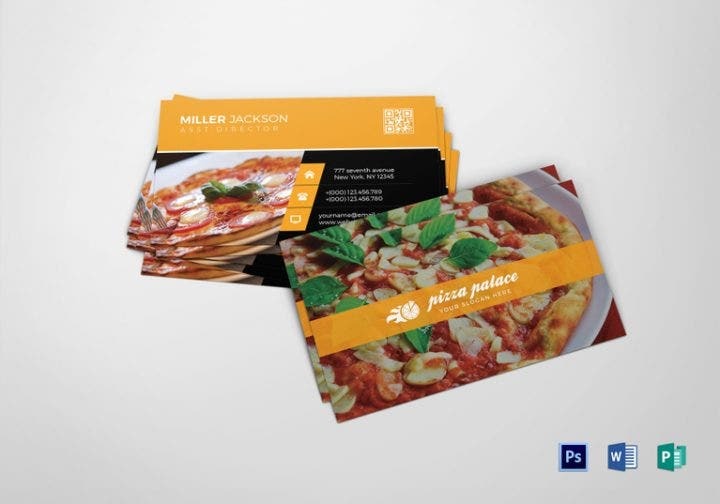 You can always edit this business card template and change the image with your own food (most likely your best-seller). You can also edit the text to fit your personal details. Chalkboard designs have become increasingly popular over the past few years. They have been used in different kinds of print materials (business cards, posters, menus, flyers, birthday and wedding invitations, etc.) for different kinds of events (business seminars or conferences, birthday celebrations, weddings, Thanksgiving, Christmas, and other holidays). 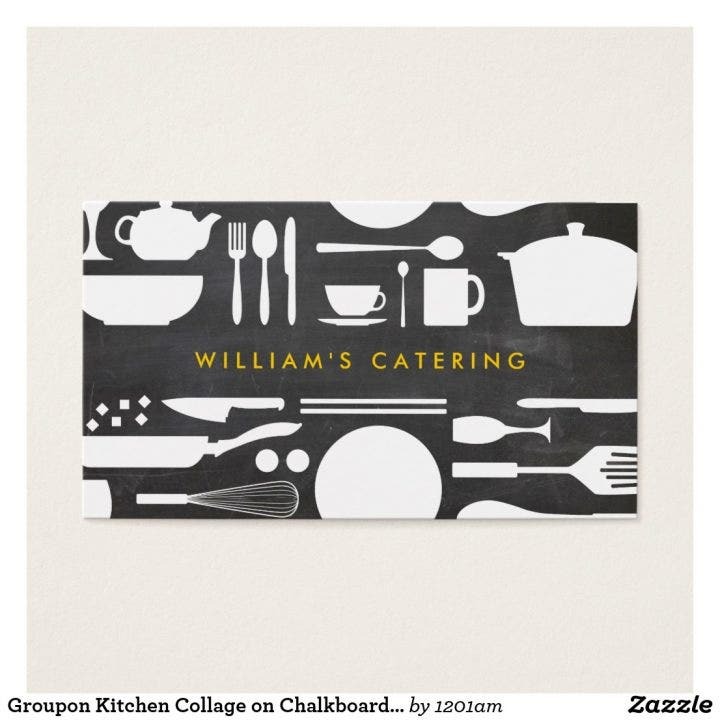 This chalkboard kitchen collage business card template uses the silhouettes of kitchen utensil, creating a very attractive business card template. 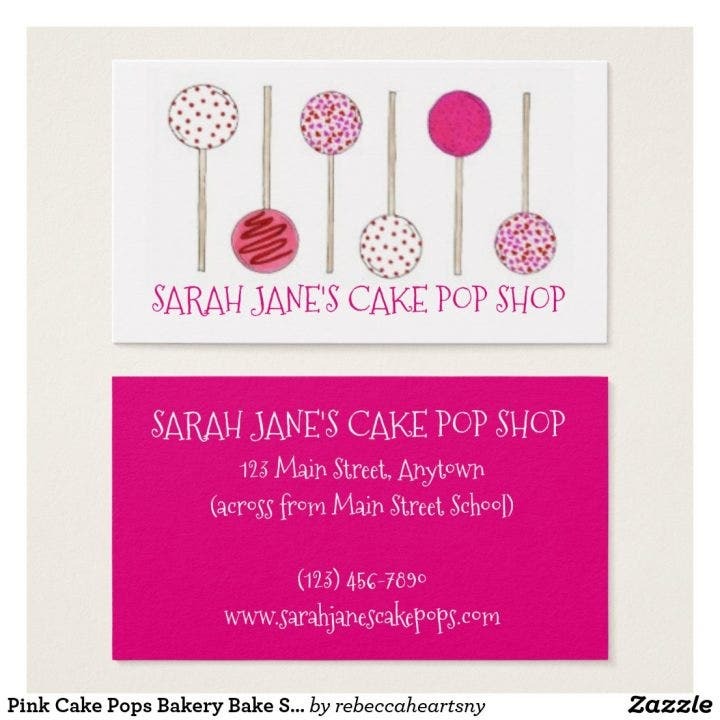 If you make some very delicious pastries, then this pink pastry shop business card template is best for you. If you do not mind the pink-colored template, then this business card is ideal for your next business meeting. The template also uses sprinkle- and chocolate-coated lollipops for additional visual design elements. Gold is always the best color used for any design. It can be elegant and exquisite, but it can fit any casual design as well. This elegant gold business card template is one of the best gold-colored business cards around and it is highly recommended for your purchase. This template uses an image of a fork painted in gold while the text also uses gold colors. Edit the text to include your own personal business card details. 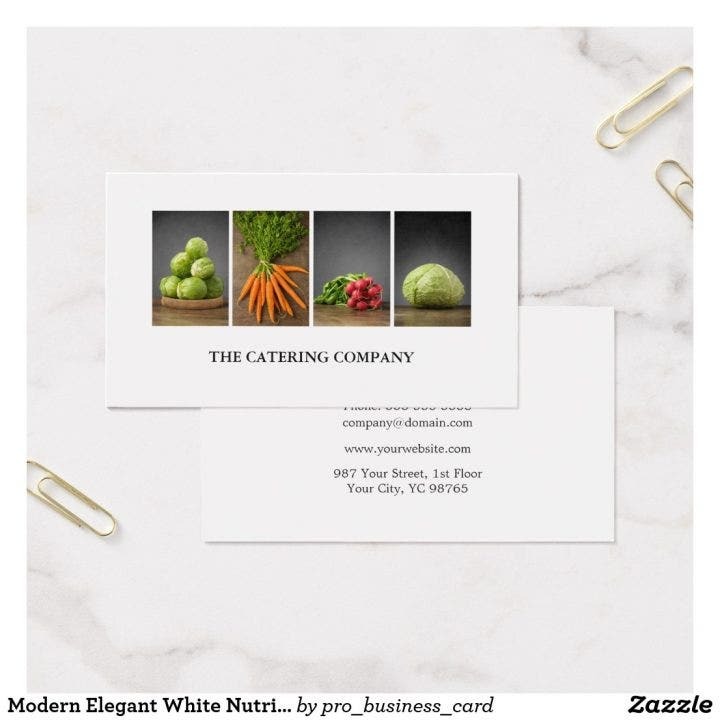 This chef or catering services business card template uses one of the most basic and popular concepts to use in business cards: food photography. This template uses some beautiful food photography and compiles them into a collage. The food photography includes beef, fish, and pastry dishes. 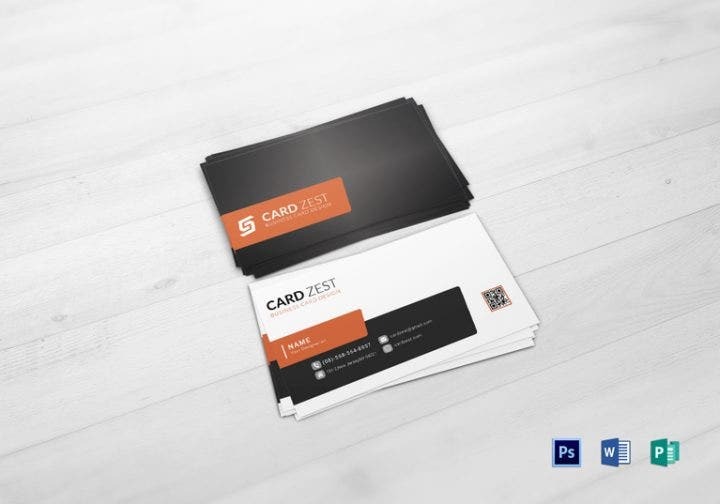 You can insert and edit your text in this business card template. Here is another elegant gold-colored business card. Similar to the other gold business card template, black is used in the background and gold for the text. A circular image with silhouettes of kitchen utensils provide the template’s main visual design. This chalkboard salad business card uses the chalkboard design to perfection. The tastefully done chalk effects in the chalkboard background do not overpower the entire design. The salad vector image that uses a flat and minimalist design adds some modern touches to the more traditional chalkboard design. Read these tips before you purchase any template designs. These do not only apply to business card templates but to all graphic design templates in general. Color adds another layer to every design. It makes designs more attractive and more enticing to people. This also applies to business card templates. Your client will not only be appreciative if you hand him an attractive business card, but he will also be more likely to remember you in the future because of your business card’s visual impact. In this case, choosing a business card for a chef is quite easy. Just add some beautiful food photos to your card and you will already make a splash when you hand out your business card. 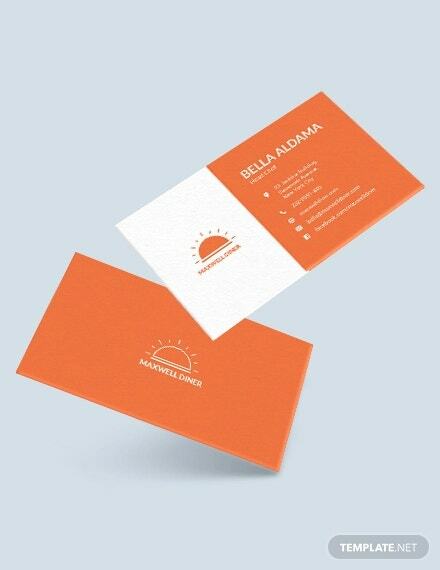 Another design suggestion for your business card is to use colors that match the restaurant’s concept (for example, if you mostly use red colors in your restaurant’s colors, do the same for the business card; or if you use a combination of colors like blue and yellow, you should use those hues on the card, etc.). Sometimes, individuals focus too much on the design that they accidentally omit the basic information of the business cards. 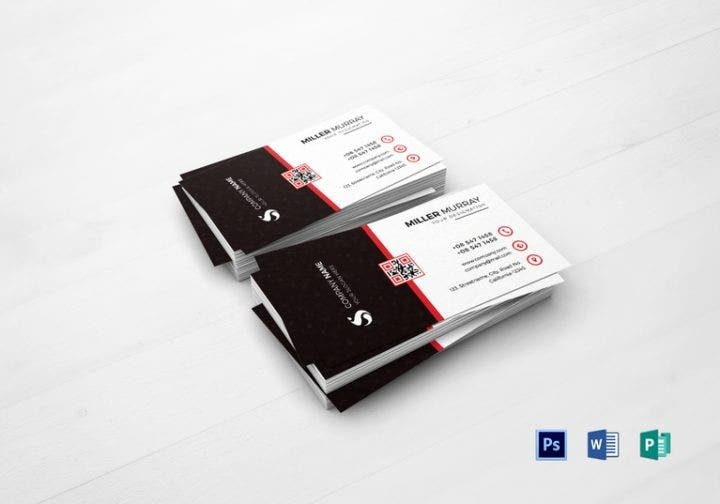 Unlike posters or flyers, business cards are more direct and need the two parties together in one setting so that the business cards can be given out. 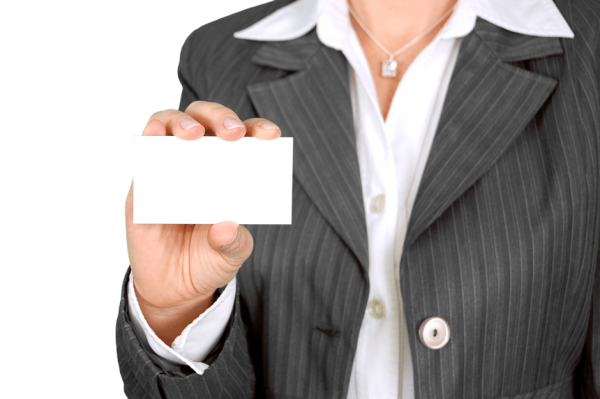 After all, the main purpose of business cards is to be informative for it to be effective. These vital pieces of information should be on the top of your priority list when you are about to purchase and edit your business card designs. Although most templates that can be purchased online are easy to edit and customize, not all are manageable. Especially for business card templates, individuals who purchase them do not need to be stressed out when customizing the card. So look for templates that include an instruction manual or help file in the purchase. Also, make sure that the designer selling the template is available to assist you after the purchase has been made. 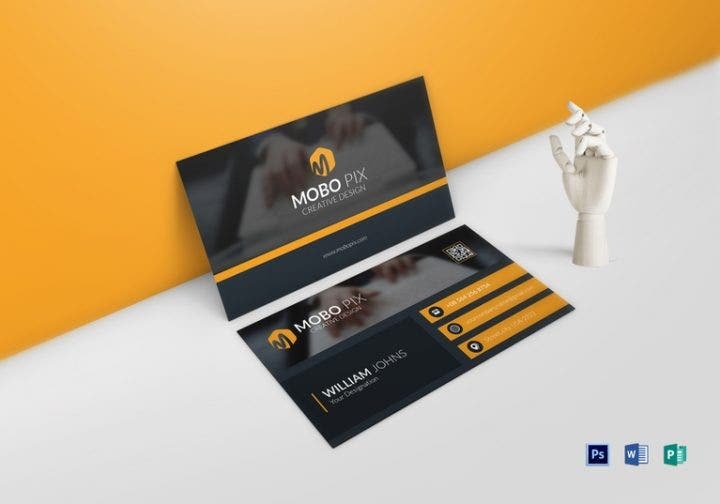 If you decide to purchase business card templates or any other kind of templates, buy from designers who are known to produce templates of consistent quality. Search for designers on reputable online design shops then be sure to browse through different collections and read customer reviews. The higher the rating of the designs, the better the quality of work a particular designer produces. This will also assure you, the buyer, that you will get your money’s worth when you finally make a purchase. We hope you enjoyed looking through our list of restaurant chef business card templates that you can use for your next business meeting. Take some time and check out other business card designs on our website.